I have been cooking heaps with blueberries lately, as they have been fairly priced at my local supermarket. I have a few new recipes that I will be sharing with you over the coming weeks. 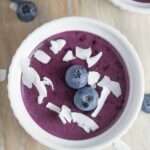 Today, I am sharing my Blueberry Mousse, which is gluten, dairy, egg, nut and refined sugar free. It is also suitable for paleo and vegan lifestyles. This blueberry mousse takes only 20 minutes to make and then 60 minutes to set. So, if you are looking for an easy to make dessert for guests, then you can’t go passed my Blueberry Mousse. This mousse is made with Great Lakes Gelatine, which I am a huge fan of. You can make so many different healthy treats with it (eg mousse, jelly, jelly lollies). I always have a tub of it in the pantry. If you are after some other amazing raw desserts to try, then make sure you check out my raw chocolate raspberry slice, raw caramel slice bites, coconut rough, raw bounty slice and best ever caramel brownie slice. Add blueberries, coconut sugar and sea salt to a small saucepan on low heat. Mash the blueberries with the sugar and cook for 10-15 minutes until the blueberries soften. The cook time does not include the time it takes for the mousse to set in the refrigerator, approximately 1 hour.